The Saratoga Hot Springs Resort realizes that pets are a part of the family, and owners want to bring them along while on vacation—no pet likes to be left behind. Kennels are provided for guest use and not available to non-guests. Kennels are available on a first come first serve basis. Pets are only permitted in the reserved Kennels and not in the Resort Courtyard, Lobby or Guest rooms. A $150 cleaning fee will apply for any pet in a guest room. 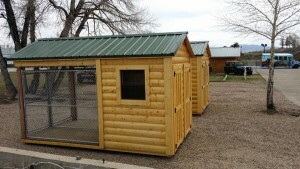 $20 per kennel per night, with A maximum of 2 pets per kennel is allowed. Food and water are to be provided by the Owner, and will not be supplied by Saratoga Hot Springs Resort. A lock will be provided for the rented kennel and must be returned after use. Owners are responsible for cleaning the kennel after use. A $50 fee for damages or failure to clean kennel after usage will apply. The Saratoga Hot Springs Resort is not responsible for any injuries or illness to your pet while at the resort. Pet owners will be held liable for any damage or injury caused by the pet to person or property. CLICK HERE for our policy for Service Dogs (based on the ADA & Wyoming Laws)!